BTU Output: up to 70,000 during Napoleon independent testing. Effective air wash in combination with high temperatures keeps the viewing glass clean. Gasketed doors will hinge to the unit fa�ade, ensuring a tight seal for proper combustion and fire viewing. With DuraVent DuraFlex, you know you're saving money and getting one of the best chimney liner systems out there at the same time. This component is no exception, a 6-inch inner diameter x 15-foot long DuraFlex liner kit that includes a CollarPlate with clamp band, rain cap with clamp band, and connector adaptor. This item is designed for use with other DuraVent DuraFlex pipes and components with a 6 inch inner diameter. Complete your DuraVent DuraFlex installation with this handy kit! It's great to know that one of the most inexpensive light liner systems on the market comes in these handy kits, saving the expense of having to buy several components. This Light Chimney Liner Kit includes a 6-inch inner diameter x 20-foot long DuraFlex liner, a collar plate with clamp band, a rain cap with clamp band , and connector adaptor. Made from 304Ti Alloy stainless steel, this kit is a durable addition to your DuraFlex DuraVent system. You'll love this kit for one of the least expensive light liner systems on the market. DuraFlex combines exceptional quality with economical prices to produce a stellar lining product. This kit includes 6-inch inner diameter x 30-foot long DuraFlex liner, a Collar Plate with clamp band, and a Rain cap with clamp band. It's all constructed from DuraVent 304Ti Alloy stainless steel, ensuring that this phenomenal light chimney liner kit will stand the test of time! On the market for a chimney liner system that works great without breaking the budget? Then take a look at this 6 Inch Diameter x 35 Foot Long Kit of 304-Alloy Light Chimney Liner from DuraFlex DuraVent. It's one of the least expensive light liner systems on the market. This is for use exclusively with other DuraVent DuraFlex pipes and components with a 6 inch inner diameter. It includes a 6-inch inner diameter x 35-foot long DuraFlex liner, Collar Plate with clamp band, Rain cap with clamp band, and Connector adaptor. The 6 inch x 20-ft. HomeSaver UltraPro 316Ti Chimney Reliner Pipe is a direct reflection of HomeSaver UltraPro's custom machining and superior engineering. HomeSaver UltraPro chimney liners begin with .005-in. thick 316Ti stainless steel which is then vertically corrugated by high-tech machines. A patented roll-lock seam is applied that yields greater strength and increased flexibility compared to more traditional or generic chimney liner pipes. HomeSaver UltraPro pipes are easy to work with, more reliable, and have a greater crush strength than similar pipes of even greater thickness. Homeowners and chimney professionals alike will agree that the 6 inch x 20-ft. HomeSaver UltraPro 316Ti Chimney Reliner Pipe is the safest, most convenient, and most effective reliner of its kind on the market. HomeSaver Pro 316Ti Pre-Cut Liner - 6 inch x 30-ft. When it comes to quality of manufacturing in the fireplace business, HomeSaver has developed a reputation that goes before it, making sure that not only you have tools that work but also that these tools are user friendly in all points. 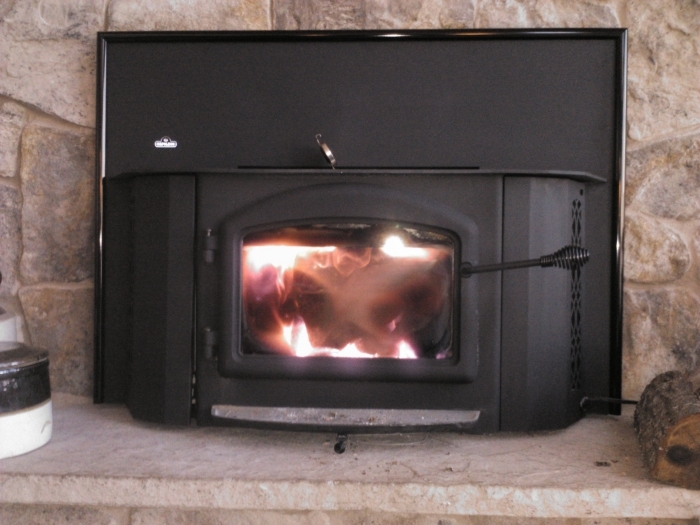 THe Pro 316Ti Pre-Cut Liner comes with the dimensions of 6 inches by 30 feet and will make sure that once it has been installed that your fireplace will give to everyone the service that rightly should be expected out of fireplace units. This Collar Plate with Band Connection by HomeSaver, is designed to be used with 6 inch UltraPro chimney liner pipes and components. This 13 x 13 collar plate features a top plate, storm collar, and top clamp - all in one unit, and.is made from 316-T1 alloy stainless steel construction, and supports the entire UltraPro installation. The built in clamp tightens with a screw driver and features a welded watertight seal for years to come. Adding a top plate to the liner of your chimney can help protect the interior of your chimney lining from getting damaged by moisture or debris. This CollarPlate has the convenience of a top plate, top clamp, and storm collar all combined into one, and it can easily be installed with a simple screwdriver. The water tight seal that is created can protect the interior of your home from significant damage, and the standard size allows you to use this product with any 6 inch liner pipes. This chimney rain cap serves as the top termination of your chimney liner pipe. This cap will keep out the rain, snow and debris that can inhibit the performance of your appliance. The cap attaches to the collar plate and is designed fo the six inch chimney liner. The cap has 3/4 inch mesh surrounding the top plate. An adjustable connection band allows the cap to be attached and loosened with nothing more than a screw driver. Non catalytic high tech design eliminates the need for a delicate ceramic catalytic combustor which can deteriorate over time. The 1402 Wood Burning Fireplace Insert's unique design allows for flush mount or hearth mount installation in either masonry or factory built fireplaces.Featuring an elegantly designed, full view single door, standard "WHISPER QUIET" heat circulating blower & thermostatic sensor, this innovative design transforms small amounts of wood into large amounts of cozy heat.Customize your 1402 Insert with an optional cast iron surround kit, available in a variety of porcelain enamel or painted finishes that will enhance your decor. * Main Picture shown with standard painted black flashing and 24 Karat gold plated arched door. * Inset Picture shown with standard painted black flashing 24 karat gold plated Webbed Arched Door. Please Note: Minimum opening for installation is 14" deep x 26" wide x 22" high with an approved lined chimney at least 15 ft. high. Only install into a solid fuel burning fireplace. The surface can be cooked on. It's not deliberately advertised because there's only a 9" projection to the surface, but it could be cooked on. Is this insert mobile home approved? This insert is indeed approved for use in a mobile home. What is the CFM output of each of the Napoleon EPA blower fans? The CFM of each blower is 200. What is the inside depth, inside height, and inside width of this Napoleon EPA wood burning fireplace insert? Also, what is the estimated burn time? The combustion chamber measures 18 inches wide, 18 inches deep, and 12 inches tall. Maximum burn time with the minimum air input setting is listed as 9 hours. In practice, 6 to 8 hours is more typical. When possible, seasoned hardwoods should be used. How many square feet will this Napoleon EPA wood burning fireplace insert heat? With standard 8' ceilings, this product has the ability to heat around 2,000 square feet. Please note that this would be in ideal situations where only seasoned hardwood is used and with a properly lined interior chimney and no environmental conditions that would hinder draft. What is the efficiency rating of this insert? How much does this fireplace weigh? This unit weighs 395 pounds, including the firebrick. The unit has a steady burn efficiency rating of 72 percent, per the manufacturer. Is the fan cord only on the right side of this Napoleon EPA wood burning fireplace insert? The blower's chord does indeed only come from the right hand side. Is a faceplate included with this fireplace insert? For this model, a 32 inch tall by 44 inch wide face plate is included as a standard item. How deep is the shelf? Does it get hot enough to boil water? This top step is approximately 8 inches in depth. Surface temperatures will indeed be hot enough in all but the lowest burn settings to boil water or to use a steamer. Does this unit require a brick chimney or can it be vented out the back of a home with stainless steel chimney duct work? Because this is a fireplace insert, it must have an existing masonry or listed manufactured fireplace it can be installed into. At the very least, a masonry enclosure must be provided, which can then be vented with manufactured chimney. Every insert and wood burning fireplace that we carry is designed to be vented vertically, with up to 30 degree offsets allowed. 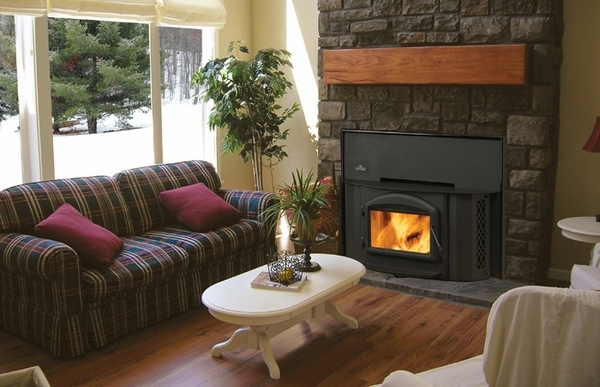 Only wood burning stoves and circulators can vent horizontally. What is the glass viewing area in square inches? The viewing area for this unit is 139 square inches. Do I need to have a metal liner to use this? Yes, this insert requires a 6" diameter stainless steel liner to be connected to the unit and run all the way up to the top of an existing noncombustible chimney. Please see the "Venting Components" tab on this item page for kits that have all the needed parts. Does this item come complete or are there additional items needed for installation? While the unit itself is complete, a 6-inch chimney liner will need to be installed in order to vent the insert up your existing chimney flue. The flashing does not necessarily need to be used with this insert, however it is recommended to use some sort of noncombustible material to close the unit in. This is a very high quality fire insert! When I got my stove, I found it easy to install. It fit close to perfectly into the fireplace opening. It looks attractive and is ready to use. Having had fireplace inserts at two previous residences, we were determined to have one installed at our current residence. Our model has the gold plated door frame which makes it elegant for our living area. We were so excited to have our new stove that we tested it in 80 degree weather and can hardly wait until it's cold so we can use it often. This stove is easy to maintain and fuss-free: just put the logs in and close the door without worrying about sparks escaping. The heat is nice and even as it radiates through the house; I don't have to adjust a thermostat to stay comfortable all day. We would certainly recommend this stove to others. I received my 1402 insert very quickly. Overall, I am very happy with the insert. It's made a huge difference in keeping the house warm. My entire 2000 square foot house is now heated by my wood insert stove, which produces a nice, even heat throughout. We use our stove exclusively now because its heat is superior to that of our furnace. In the morning, there are still live coals burning, making it easy to keep the heat going by simply putting in more logs. The only part that doesn't seem as heavy duty as the rest of the stove is the draft regulator, though I have not experienced any problems with it. Overall, however, I am very pleased with my stove. I've owned my stove for five years and have not had trouble with it at all. When the fan stopped operating, it was inexpensive and easy to replace. My heating bill is over $100 lower in the months I use my stove. This stove is durable and easy to clean and maintain. I highly recommend it. My stove's heat lasts all night; the fan quietly circulates the warmth. I'm very pleased with this product. 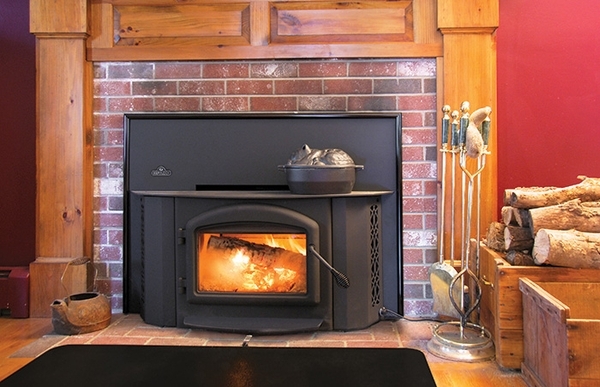 Our wood stove insert has saved us almost $100 per month in energy costs. We burn it all the time now instead of using our furnace. It is very efficient; we usually load it three times a day. The heat lasts all night; in the morning, we just put more wood on the coals to keep the fire going. We feel very safe since the fire is enclosed in the wood stove insert. When we use the fan to circulate the air, we notice a slight increase in our electric bill, but the savings from the gas furnace bill more than compensate for that cost. The fan is normally pretty quiet when set to the lower speeds, but does have a noticeable sound when set to a high speed. 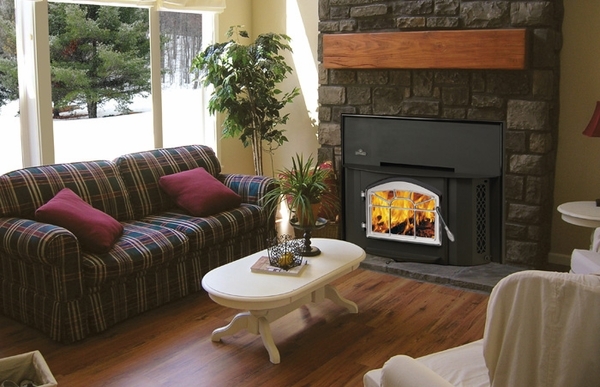 Our wood stove insert is easy to maintain and looks attractive in our living area. Best of all, we stay warm and cozy while saving a lot of money. We would definitely recommend this stove, and would buy another just like it if we had the choice again. We did our research before purchasing this stove, and found it to be the best buy for the money. It functions well, giving off cozy warmth and adding beauty to our room with its attractive design. We enjoy being able to see the fire, too. It has saved quite a bit on our heating costs. I actually ordered two of these stoves; one for myself and one for my neighbor. All the parts were shipped and delivered on time. My stove is replacing the use of my oil burner which is too expensive to operate. I believe my savings will compensate for the cost of my stove within two seasons or less. So far, I have been very pleased with the performance of my stove. It burns cleanly, leaving very little ash.